It’s hard to believe that the last day of International Quilt Market is already upon us. There is always such anticipation leading up to the big event and then it always seems to go way too fast! We’ve been having a great time and will post a recap of some of our favorite parts later this week. Today, we wanted to throw a spotlight on a few of the projects currently on display in our booth. Sure, if you’ve at market, and you’ve been to our booth, you’ve seen these beauties already. But, if you’re following along from home, isn’t it nice to get a little recap — give the designers a little shout-out? We think so too:). Thank you SO much to all of the talented designers who sent us projects to put out on display. You all make us look good!! We’ve almost been having too much fun with Flex-Foam™. Is that possible? From the release of the sew-in earlier this year to the release of the Fusibles (both 1-Sided and 2-Sided) last month, to the addition of 60″ rolls… and now? Packaged Flex-Foam!! That’s right, we’ve now got a little something for everyone. Need a full 60″ roll for a plethora of projects? We’ve got that. Need a quick 20″ x 60″ package for a few weekend crafts? No problem. If you’re at International Quilt Market this weekend in Houston, TX, make sure to stop by our booth to get a closer look. We’ll have some samples on hand and are there to answer any questions you might have. Oh — and just in case you needed a little extra inspiration, we’ve got a perfect weekend project all ready to go! The Succulent Wall Planter is quick, easy and a super cute way to put some of those mini-succulents on display. Scroll down for the full tutorial and drop us a line if you have any questions! — Two 2” x 2-1/2” rectangle for hanging sleeve. Follow manufacturer’s instructions for application of all interfacing. All seams ¼” unless otherwise indicated. RS = Right Side; WS = Wrong Side. Step 1 – Center one Flex-Foam 1-Sided Fusible rectangle on the WS of one exterior fabric rectangle and fuse. Repeat for remaining exterior fabric rectangle. Step 2 – Remove the paper backing from one Vinyl-Fuse rectangle and carefully finger press the sticky side to the RS of the interior fabric rectangle. Fuse. Repeat for remaining interior fabric rectangle. Step 3 – Place the Shape-Flex rectangle against the WS of the 2” x 2-1/2” fabric rectangle and fuse. Step 4 – Place exterior rectangles RS together and pin. Place interior rectangles RS together and pin. Trace and cut a 1” notch in the lower left and right hand corners of both the exterior and interior units. Step 5 – Sew along the sides and bottom of the units, locking stitches at each end, leaving one long end open. Step 6 – Open the notched corners on each unit, pinch in to align raw edges and match seams. Pin and sew. Step 7 – Turn exterior RS out, push out corners and straighten. Fold top edge in by ¼” and press. 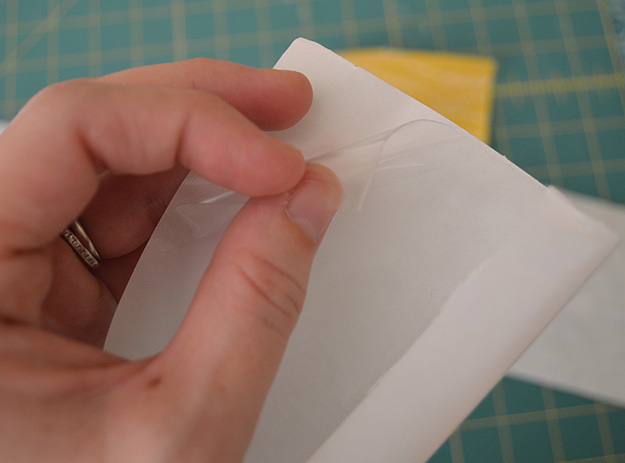 Step 8 – Fold top edge of interior down to the outside by ¼” and finger press. Step 9 – Place interior inside exterior and match top folded edges. Set aside. Step 10 – Fold the long sides of the 2” x 2-1/2” rectangle in by ¼” and press to create a 1-1/2” x 2-1/2” rectangle. Topstitch along the folded edges. Step 11 – Fold in half to create a 1-1/4” x 1-1/2” piece. Press fold. Step 12 – Insert raw edges in between top long side of the exterior and interior pieces so that only ¾” is exposed. Pin. Step 14 – Repeat full process to create remaining planters. Step 15 – Insert stick or dowel through the hanging sleeves and arrange as desired. Step 16 – Tie twine or ribbon to both ends of the stick or dowel to finish. pssssssst. Don’t forget about our Missing Market Giveaway! It runs through 3pmCST on Monday, October 26. Click here for more info. Today’s feature project comes from a brand new Project Designer for Pellon, Nancy Spaulding of Baby Rozen Design. We are so thrilled to welcome her to the team and can’t wait to see all of the gorgeous creations that she’ll contribute. 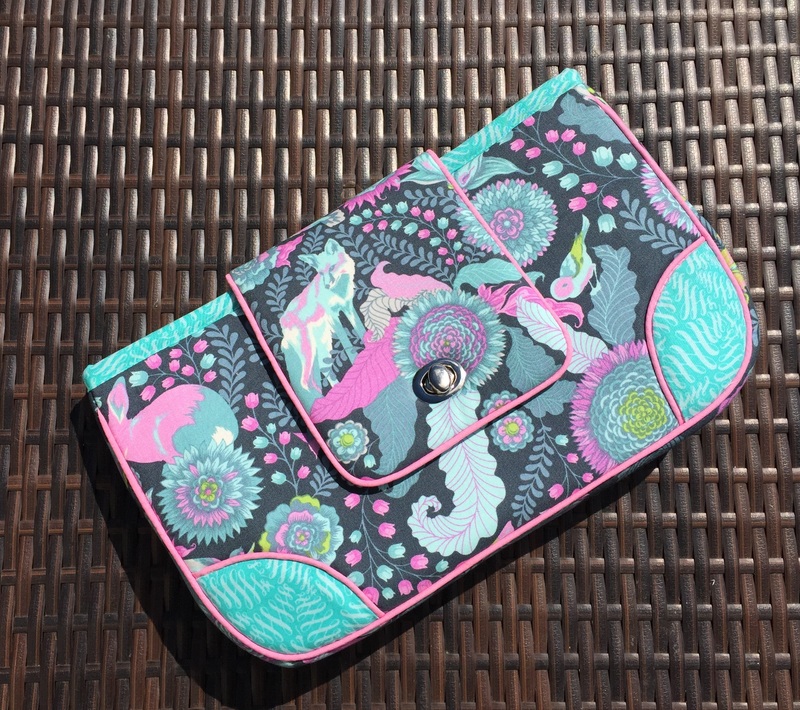 We’ve had our eye on her thanks to her gorgeously sewn handbags and feel so fortunate that she created a brand new pattern to share with us and all of you! Nancy had the opportunity to work with both the 1-Sided and 2-Sided Fusible versions of our Flex-Foam™. You can read all about what she thought over on her blog today! For a free downloadable pdf of this pattern, visit the project page here. We’d love to see what you make, so be sure to post a photo on our Facebook page, tag us (@pellonprojects) on Instagram OR share with our ‘Made with Pellon®‘ flickr group! Don’t forget to follow along with all of our fabulous designers all week for impressions on our new Fusible Flex-Foam products, new projects, reviews and more! Originally from Arkansas, Nancy is now a proud transplant living in the beautiful state of Vermont. She is a wife, a mother of 4, a veteran, an artist, a business owner, a sewing pattern designer, a graphic designer, and an aspiring fabric designer! She LOVEs all things fabric and always say if it can be made of fabric, she can make it! Have you been following along with the Fusible Flex-Foam™ Blog Tour? We’ve been having so much fun this week and have absolutely adored the new patterns and projects that have come from our fabulous line-up of bloggers. There are so many great uses for the Fusible Flex-Foam — we just know that this tour is only the tip of the iceberg. We’re truly looking forward to seeing what you all make! Today, we’re showcasing a project of our own — a little preview actually, since the full project will be available on Tuesday on The Stitch (Hancock Fabrics’ Blog) — The Jackson Nap Mat. This one is a great ‘back-to-school’ project, though it’s really intended for kiddos who are daycare/preschool age. My daughter is 23 months old and just started a new daycare this week. She still takes one long nap in the middle of the afternoon and has been out of the pack-n-play and on her very own nap mat for a few months now. She loves it and gets excited that she has a place that is all her own to snuggle and snooze. Our second is on the way in November, a baby boy, and though it’s a little premature, I couldn’t help but craft this nap mat for him. The Flex-Foam™ provides just the right amount of cushion, the flannel fabrics create the cozy, the handy elastic closures make it super portable and the name appliqué makes it personal and unique. I’m a little bit in love with this one! Don’t forget to check back in on The Stitch on Tuesday, September 15 for the full tutorial. You can grab your Flex-Foam 1-Sided Fusible on Monday in Hancock Fabric Stores or online at http://www.hancockfabrics.com. Don’t forget to follow along with all of our fabulous designers all next week and next for impressions on our new Fusible Flex-Foam products, new projects, reviews and more! **make sure to check our launch post (first link on the tour!) for information on product availability, in-store dates, and a SUPER FABULOUS GIVEAWAY!! We’re feeling a little giddy this morning. Why, you might ask? Today, we not only get to share a truly awesome new project, but we also get to introduce a brand new Project Designer for Pellon. 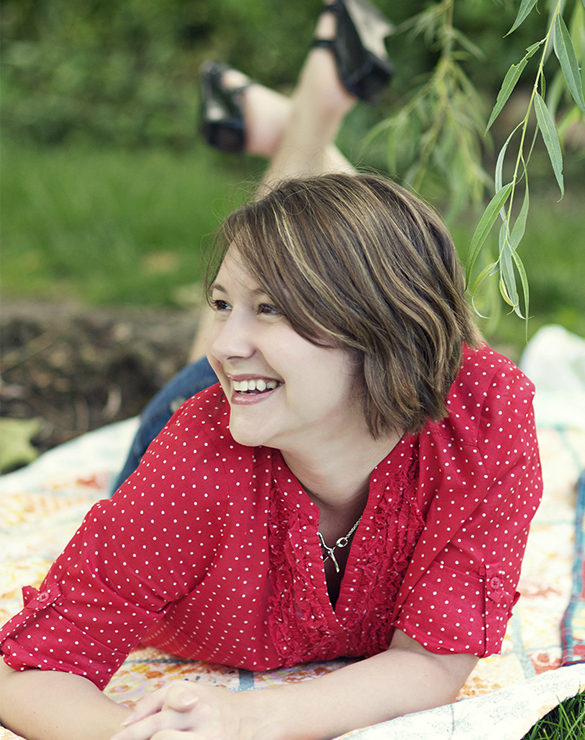 Please join us in a very warm welcome for the lovely and talented Caroline Hulse of Sew Caroline. Caroline writes and creates for an amazing blog but it doesn’t stop there. She is also a licensed fabric designer for Art Gallery Fabrics (her latest line, Happy Home, is featured in the project below) AND a women’s sewing pattern designer. We are particularly fond of the Out and About Dress, but honestly, we’d be happy with any one of her designs;). As she prepares for a new family addition (Congratulations!! ), she’s also been adding some fun DIY tutorials for baby like these adorable baby bloomers. Watch out, you could probably lose your whole Saturday browsing around her site! Caroline just finished up a fabulous new project using our Flex-Foam Sew-In and we honestly can’t wait to make a few for ourselves! The Happy Home Floor Pillow is an excellent way to brighten your home décor. Use favorite fabrics and match colors to your style to create the perfect piece. This one lives in the nursery and uses Caroline’s Happy Home fabric line for Art Gallery Fabrics. Caroline Hulse is a creative lifestyle blogger, women’s sewing pattern designer, and fabric designer licensed with Art Gallery Fabrics. She resides in Fort Worth, TX with her husband, their pup, and a baby on the way! On her site you can find sewing tips, tutorials, sewing patterns, and all kinds of modern sewing inspiration. Follow her on Instagram (@SewCaroline) for daily inspiration. Day two of our Flex-Foam™ blog tour brings about this super sweet Zipper Pull project. Crafts by Emily of Mommy’s Nap Time, this is an easy project that will help anyone add a bit of sass to any zippy pouch, purse, or backpack. Use a favorite fabric, fussy cut a special design, add a bit of mini-appliqué, or do some free-motion quilting to add some dimension. Whatever you decide, this little pull will be the cutest, easiest little project you’ll make all week! Don’t forget to follow along with all of our fabulous designers this week and next for impressions on our new Fusible Flex-Foam products, new projects, reviews and more! ** make sure to check our launch post (first link on the tour!) for information on product availability, in-store dates, and a SUPER FABULOUS GIVEAWAY!! Everyone loves a great zippy pouch, right? How about a zippy pouch that doubles as an insulated snack bag to keep snacks, juice and other munchies nice and cool? How about a zippy pouch that is personalized so you’ll always know whose is whose? The Star Insulated Snack Bag by Jennie of Clover + Violet covers all the bases and we’re a little smitten. Jennie adapted a simple zip pouch to include a layer of our Insul-Film™ to keep her kids’ snacks fresh and crisp throughout the day. We love the little star with the embroidered initial in the center. Not much for embroidery? You could try appliqué instead, or perhaps a fussy cut of a favorite pattern. There are endless options! The pattern for this new Summer essential is up on our site today and you can grab everything you need right here. When you need to bring a little something, but don’t need an entire lunch bad, this snack bag is perfect to grab and go. It is insulated and quilted, so it’s nice and sturdy, but doesn’t have the bulk of a regular lunch bag. The snack bag measure 7″ tall and 9″ wide and has a zipper top to keep things secure. Jennie is one half of the mother-daughter team of Clover & Violet. She works with her mom, sewing, quilting, and designing patterns (mostly for patchwork bags, but also for embroidery). It is a dream-come-true kind of job, doing what she loves, working with her dearest friend, and having her fabric habit paid for! Jennie is also mom to two busy toddlers who love to help her sew, play with her fabric scraps, and roll around on unfinished quilts (they’ve also both already developed a healthy love of fabric too!). Even if it is a little hectic at times, it is the perfect daily adventure! We are having a full-fledged love affair with Flex-Foam™. We use it in structured handbags, totes, pouches, tablet cases, small accessories, and so much more. This stuff is so fabulous to work with and so versatile, the uses are really just endless! We know you’ve all been having a blast as well and we’ve LOVED seeing all of your creations on Instagram, you talented crew, you;). Today, we’re excited to announce that Flex-Foam™ is reaching wider distribution and is now available in Hancock Fabric Stores as well as on their website! Woo hoo! We’d suggest a weekend trip to your local store to grab a few yards. We’ve even got a fun little tutorial to help you get started! This one is super fast, super easy and incredibly handy. It’d make a great shower favor, teacher gift, or just something to let a friend know that you think she’s pretty cool;). Use a combo of your favorite fabrics, add some appliqué, show off your creativity… and don’t forget to show us what you make! We are inspired by YOU every day and that is the best kind of inspiration. The Grab-N-Go Pouch is a simple little catch-all for all the essentials. It’ll fit your phone + some money, a few credit cards, some chapstick and any other small accessories needed. There’s even an external key ring to keep everything all in one place. I’ll be using this one all Summer. It’s so easy to fill up and pop into my daughter’s diaper bag and it will save me from having to lug around two bags everywhere we go. This would also be a great pouch for pool or beach trips. Make it with a laminated cotton or add our 100 Vinyl-Fuse™ to your favorite quilting cotton for extra protection. Seriously, this is one customizable little zippy! ** 1/4″ seam allowance unless otherwise noted. Follow manufacturer’s instructions for application of all interfacing & fusible web. Step 1 – Assemble supplies. Step 2 – Place Shape-Flex® rectangles against wrong side of coordinating lining and key ring tab rectangles and fuse. Step 3 – Place Flex-Foam™ rectangles against wrong wide of exterior fabric rectangles. Baste around all edges to secure or quilt as desired. Step 4 – Trim zipper to 7″. To create zipper zabs, cut a small rectangle of exterior or coordinating fabric (sample used a scrap with a width of 2-1/2″). Fold in half lengthwise and press. Open and fold raw edges in to meet center fold. Press. Re-fold on center crease. Insert zipper ends into the fold and pin. Step 5 – Topstitch to secure and trim edges to match raw edges of zipper tape. Step 6 – Place exterior 3″ x 8″ rectangle right side up. Center the zipper on top, matching raw edges so that zipper pull is on the left and facing the right side of the exterior fabric. Place the lining 3″ x 8″ rectangle right sides together with the exterior rectangle. Pin and sew using a zipper foot. Step 8 – Repeat Steps 6 & 7 using the remaining 3″ x 8″ rectangles. When placing the zipper unit, be sure that the exterior rectangles are right sides together and the lining rectangles are right sides together. Step 9 – Place the exterior and lining 5″ x 8″ rectangles wrong sides together and pin. Place the 5″ x 8″ unit right sides together with the zipper unit and pin. Make sure that zipper is at least halfway open. (I opened mine up all the way for easy turning later.) Square up all raw edges. Step 10 – To create the key ring tab, fold the 2-1/2″ x 3″ rectangle in half lengthwise and press. Open and fold the raw edges in to meet the center crease. Press. Re-fold on the center crease and pin. Topstitch both folded edges. Step 11 – Fold tab in half and place in between the front and back units in desired location. Make sure that folded edge is facing in and raw edges are out. Step 12 – Sew around all four sides. Finish with a zig zag stitch, or trim with pinking shears to prevent fraying. Step 13 – Turn pouch right side out through the open zipper and carefully push out all four corners. Press pouch for a nice clean finish. Step 14 – Insert essentials and prepare for your next adventure! See? SO easy!! We hope that you’ll have fun with this one. Don’t forget — you can now grab all the Flex-Foam™ that you need both in-stores and online at Hancock Fabrics! Did we mention that they sell by-the-yard online?? HUGE bonus!! These days, I’ll find myself stopping in the doorway of my office, staring in, thinking ‘I want to change everything!’. I’m sure many of you have had the same experience. It happens after time, particularly with the rooms in which you spend most of your days. It would be amazing if we could all just start completely fresh, but that isn’t always possible. So… what’s the next best thing? Making simple and easy changes to your key pieces that will drastically change the look and feel of the room. It’s a quick and affordable option and allows the opportunity to fully customize. Choose your colors, your favorite fabrics, preferred designs — it’s the best! That’s why we love today’s feature project so much. Angela Pingel reached out to us not long after we launched EZ-Steam® II. She had a great idea for backing a bookcase in fabric and thought it would be the perfect product for the job. Turns out she was right! Take a peek at her custom bookcase below and make sure to click through for the simple how-to. The only question now is what fabric will you choose to feature in your space? This project allows you to transform any ordinary bookcase into a complete custom piece using just one product, EZ-Steam® II, and your favorite fabric. Let your imagination guide you and create a one of a kind piece for the perfect spot in your home. Angela Pingel is a self-taught quilter who has been sewing for over 20 years. Angela has recently published her first book, A Quilter’s Mixology, and filmed a DVD on the subject of curved piecing. She can be found in the 1500 series of Quilting Arts, airing on PBS, and has been published in numerous compilation books and magazines. She manages her blog, Cut To Pieces, in her free time between sewing and raising her sweet little girl with her husband. Have you ever been SO excited to share something new that you can hardly contain yourself? We’ve been waiting and waiting to share this news and it’s a wonder we haven’t burst with excitement! Please allow us to introduce (drum roll please) Flex-Foam™! Flex-Foam™ is a lightweight sew-in stabilizer consisting of a layer of foam sandwiched between two layers of soft fabric. It can be used in place of or in addition to other stabilizers, is an absolute breeze to sew through and will add a soft shape and body to any project. but have a feeling that you’ll come up with your own fabulous uses for this great new product. Let your imagination run wild! For now, Flex-Foam™ is available in Jo-Ann Fabric & Craft Stores only, but we’re working on a full product release. We’ll keep you posted!! In honor of the product launch, we created a handy little foldover lunch tote. The easy how-to is available via Joann.com and should be on display as a FREE project sheet in Jo-Ann Fabric & Craft Stores starting this week. Spring is almost here, which is an excellent time for a little lunch tote refresh. Make them for your kids, your friends or for yourself. The tote features a PUL lining (so easy to clean!) and easy instructions to personalize the tote so you’ll always know which one is yours! * Sample uses the following: Fabric A – Scattered Leaves Indigo by Cloud 9 for Jo-Ann, Fabric B –Scattered Leaves Twig by Cloud 9 for Jo-Ann, Fabric C – Asters Indigo by Cloud 9 for Jo-Ann.